Looking for a speaker for your classroom or community event? I love sharing an author’s perspective on creative writing. Some of my favorite topics include scene building, dialog (both internal and external), and paths to publication. Grades 7-12 are the ideal audiences for my books, but I love talking to students and readers/writers of all ages. My presentations are highly interactive; I will work with you to customize the program to meet your needs. Please contact me for more details! 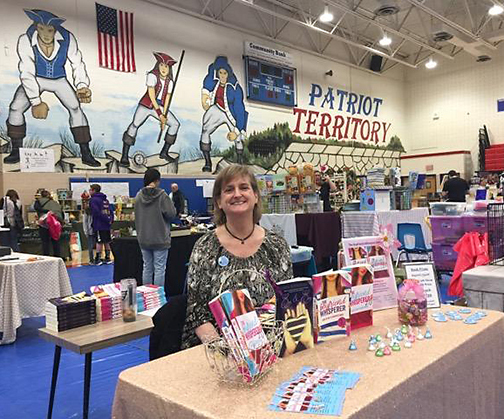 Had so much fun selling and signing books in Patriot Territory at the Park View Craft and Vendor Show! This is the high school where THE BOYFRIEND WHISPERER series is (loosely) set! Victory, victory is our cry! Book sale and signing at an ARTisans of Loudoun event at House 6 Brewing Company. YA author panel at the Ellicott City Barnes & Noble. “Read Local/Eat Local” Book Sale and Signing Event at Cascades Library in Sterling, VA. Presentation and book signing at the Virginia Association of School Librarians Conference. NaNoWriMo Panel at the Reston (VA) Library, hosted by the SCBWI Mid-Atlantic Chapter. Local authors panel at the Frederick County (MD) Reading Council’s Spring Event. Book sale and signing at the Park View High School Craft and Vendor Fair. “Paths to Publication” panel at the Virginia Chapter of Romance Writers of America’s February meeting. Guest author at the Joy of Reading book club in Sterling, Virginia. Breakout presentation on “Writing YA Romance” to the Mid-Atlantic Chapter of SCBWI. Presentation to the Sterling United Methodist Church Senior Activities Group (SAG … yes, they have a sense of humor!) on writing and publishing. Romance authors panel at the “Night of Romance” event at the Barnes & Noble at Potomac Yard, Alexandria, Virginia. Guest author at Book Lovers’ book club in Arlington, Virginia. Guest author at the Grace Readers Book Club in Sterling, Virginia. EM & EM book release party at Cascades Library in Sterling, Virginia. Release date for EM & EM, published by Swoon Romance. Young Adult Chapter, Romance Writers of America Awards Reception: My work in progress, THE BOYFRIEND WHISPERER, received First Place in the annual Rosemary Award’s “Contemporary Romance” Category. Virginia Chapter, Romance Writers of America Awards Luncheon: My work in progress, THE BOYFRIEND WHISPERER, received First Place in the annual Fool for Love “Published Authors” Category. Release date for THE FUNERAL SINGER, published by Swoon Romance.